Our open adoption expert explains why it's important to draw up a contact agreement before the expectant mom who picked you gives birth, and what you should include. A post-adoption contact agreement (sometimes called open-adoption agreements) is important for all adopting families to have. As you and your spouse get to know the birth mother, formal arrangements may not seem necessary. But having them in place ensures that both the adoptive and placing families are clear as to how communication between them will be handled after the child’s adoption. Imagine that, in your excitement before the birth of the baby, you tell the birth mother, “Get in touch anytime.” You’re imagining sending a few emails and a photo, while she interprets “anytime” to mean monthly visits. These very different ideas can cause disappointment and anger on both sides. It is scenarios (and surprises!) like this that emphasize the need for written agreements. By establishing clear boundaries and expectations, you reinforce each family’s commitment to caring for the child, now and in the years ahead. Think carefully about what you agree to — and be sure that it’s something you can live with for the next 18 years! Contact agreements are legally binding in many states, and some courts in states where such agreements are not technically binding enforce them anyway. However, an adoption cannot be overturned because of either party’s failure to comply. If mediation becomes necessary, you will have the right to say whether compliance with any of the conditions in the agreement is in the best interest of your child. 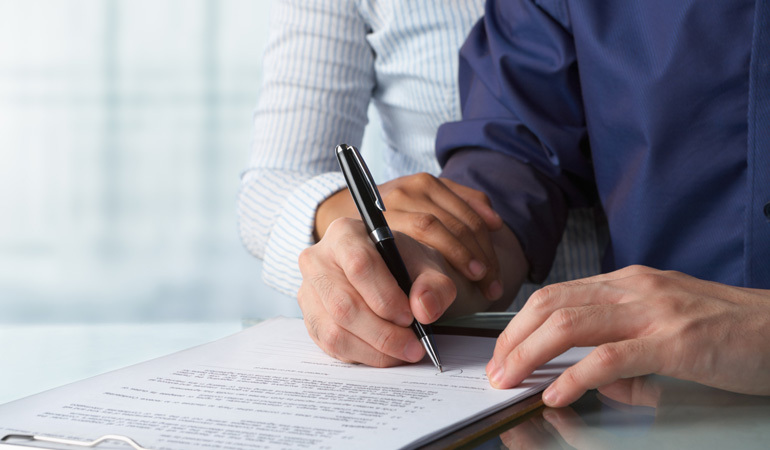 Many agencies and attorneys have form agreements that you can personalize by filling in the blanks. If you aren’t given a form, there are some topics that all families should include in the agreement they write. Typically, both parties discuss the type and frequency of contact they want. Then everyone meets with their adoption professional for more discussion and to complete and sign the actual agreement. Contact agreements vary, depending on the degree of openness you want with the birth family. One couple I know, Mark and Cindy, matched with a birth mother, Kerry, who wanted to visit their son each year on his birthday. The parents were happy to include her in their celebration, and 12-year-old Michael enjoys knowing Kerry. Another couple, Dave and Sue, wanted their daughter’s birthday to include only immediate family. They allowed a visit during Lauren’s birthday month, but not on the birthday itself. Some agreements preclude visitation, and, instead, specify written contact: letters, cards, or emails. Specify in your agreement the type and frequency of contact in the baby’s first year and in the years after. Usually, the birth mother wants more frequent contact during the first year, when she is grieving. Set down what you agree to regarding the sharing of photos, letters, calls, emails, and/or visits. It’s a good idea for all families to specify the minimum amount of contact they will have. For instance, if your agreement deals with face-to-face contact, discuss the number of visits, along with the duration and location of each visit (half day, one day, and so on). You might also say how special occasions will be handled. For example, does the birth mom want to visit at Christmas and bring gifts? Are you OK with that? Stick with your gut feelings. Some parents feel they have to “agree to anything” in order to adopt. Yes, you might adopt the baby, but you might also end up with a visitation schedule you’re not happy about. Don’t consent to more contact than you want, thinking that the birth mother will want less contact over time. Assume that the level of contact you agree to now will be the level of contact the birth mother will want forever. Leave room for minor changes. Make your agreement flexible enough to accommodate small changes. One of you may move, making email contact more practical than long-distance calls. Or the birth mother may have other children, lessening her ability to continue frequent contact. You might specify that there will be annual visits as long as both parties reside in the same state, adding that this condition of the agreement can be amended if either party moves out of state. Keep up the relationship. Last but not least: Take the time now, while the birth mother is pregnant, to build a positive relationship with her. If you trust each other, you can work out minor issues over the years, and avoid getting a court involved! Good communication will be more important in the long run than any agreement you sign. AF Asks: Tell Us About the First Moment With Your ..